has always preferred confined areas. I think it's a security thing. I think she feels safer when she feels like she's 'hidden away'. My darling Molly is also a major Mommy's Girl. She's my heart and soul, and she knows it. In return, she gives me complete devotion and love. Basically, Molly is always right by my side. You compromise and find the next best thing. 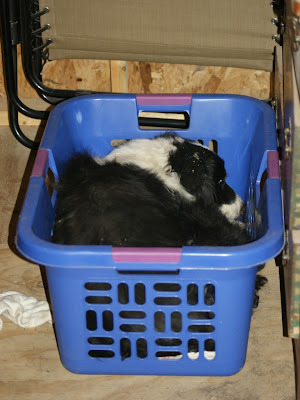 Basket O' Border Collie, anyone? So, she now has a paint sample on her ear. I am sharing those over at Misty's Words today. 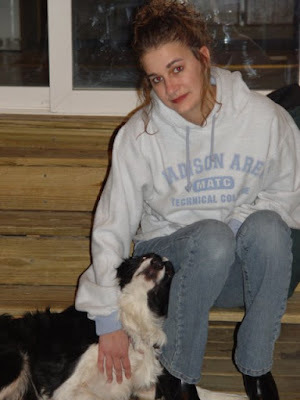 Our Badger was a lot like Molly - always with D'Star whenever possible. Nice and amusing pictures of Mo, looks like a cute dog as a housefriend. She just loves her mom, that's all. She's very sweet, paint sample and all. SO. PRECIOUS. I love that Molly! Isn't it great to have such a loyal companion? Mine are like that, too - always by my side! Misty: That dog of your has found a new bed. You might as well get a new basket. 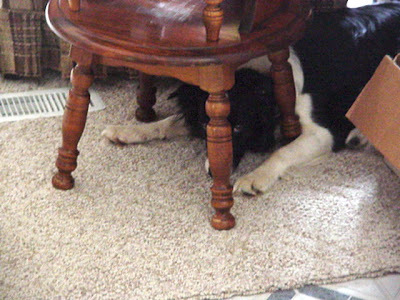 I love the one of her under the bench. She really looks like she thinks she's hiding. hehe. Great shots of Molly. It certainly looks like the laundry basket was made for her...hehehe. 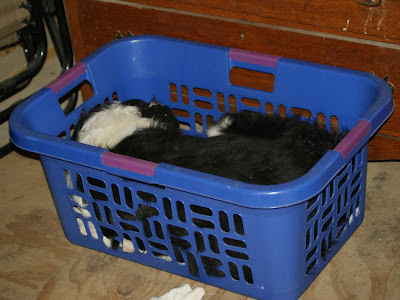 Yes, I would love to have a Basket O' Border Collie! I love Molly... what a sweetheart! i think this is the first time i've seen your photo! loved the post - blackie also has his nicknames: blackie, blackie bo, blackie mo, black, blacks, black black........ hehe! Good golly, that's a great collie. Cute pictures how in the world did such a (big boned) dog fit into a laundry basket? How wonderful are animals faithful and giving unconditional love. Lovely photos of you! Thank you for showing them. Molly looks like a great dog! Love the look she's giving you from under the table! Molly is such a sweet pea. Hi. I haven't played in ages but had some critters to share this week. Lovely pictures you have shared! That's just too darn cute!! Molly in the basket is the most adorable thing! I always have two followers with me all the time. My cat and dog are never far from me. Nice shots! My very first entry is up as well. Take care! Awwww what a sweetie she is snuggling in the basket :) Beautiful pics of your girl! She's sleeping in the laundry basket!!! That is so cute!! !